There's not much I love more than a dish I can make for breakfast or dinner. 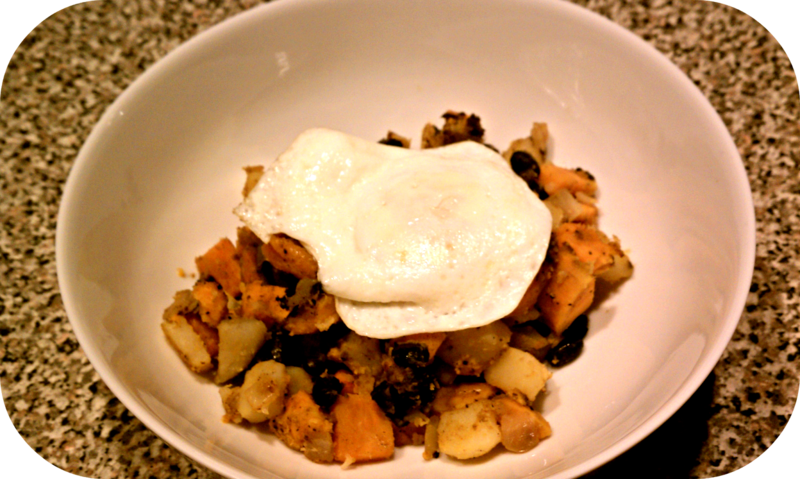 This hearty sweet potato hash is my new favorite go-to for "brinner". Most days my husband and I don't have time to cook a more elaborate breakfast, opting instead for oatmeal, cereal or simple eggs and toast. I love cooking breakfast for dinner because it gives us a chance to really enjoy some of our breakfast favorites. I had never seen a recipe for sweet potato hash that included black beans and I really love the heartiness they add to the hash, along with the balance of smoked paprika. A sprinkle of scallions would be fantastic on top too. I first discovered how much I adore sweet potato hash on my honeymoon, when we got to eat at Cat Cora's restaurant Kouzzina at Disney World. We had brunch there and her sweet potato hash dish was incredible. I have been woefully unsuccessful at re-creating it, but I'll keep trying! To make the hash more of a complete meal, I topped it with an over-easy egg, mostly because I'm a little afraid to attempt poaching eggs. Maybe I'll conquer those later this year! What are your favorite breakfast foods to make at home, and do you ever make them over for "brinner"? Heat the olive oil in a large skillet (preferably cast-iron) set over medium-high heat. Add garlic and cook for 1 minute, stirring frequently. Stir in the cooked sweet and russet potatoes, sprinkle generously with salt & pepper and add in the smoked paprika. Cook, stirring occasionally, until the potatoes start to brown, 8 to 10 minutes. Stir in the black beans and make sure they’re heated through. Serve topped with crumbled bacon or an over-easy egg for a complete meal!